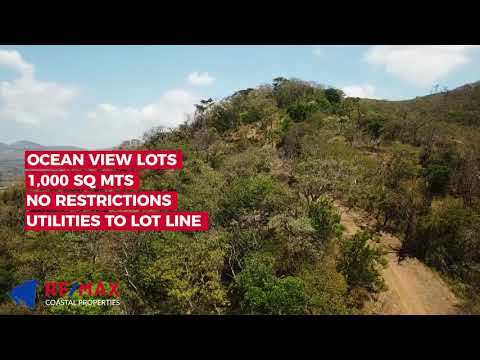 This ocean view lot is located in the boutique development of Congo Hills, which is approximately 10 minutes south of the town of San Juan del Sur. This 550 sq mt lot has very gentle sloping terrain as well as ocean views toward Playa Remanso. The best feature of this lot is that it has no restrictions; whether looking to build a residential home, a few apartments, or a bed and breakfast – your imagination is your only limit. Additionally, there are 3 neighboring lots which are also for sale for a total of 2,200 sq mts. Most residential developments do not allow commercial projects on individual lots, so this is a great opportunity to take advantage of the infrastructure investments which have already been paid for by the developer. Water and electricity are available on the lot line and access to the lot is maintained by the developer. The gentle sloping terrain ensures a lower land-movement investment once construction begins. Congo Hills is a very popular boutique development located 10 minutes from Playa Remanso, one of San Juan del Sur’s primer surfing beaches. The beautiful tree filled landscape is a favorite amongst the development’s residents and renters. A new condo project is under construction which is sure to increase property values in the development in the future. Congo Hills boast a very steady stream of both short term and long term rental clients, making this lot the perfect location for rental units. The ocean view lot is located less than 30 seconds from one of San Juan del Sur’s most popular restaurants, Black Monkey. The restaurant and pool are a favorite amongst locals, expats, and tourist for having drinks pool side, relaxing in hammocks, or having a delicious gourmet meal. Take advantage of this lot, and the additional lots if necessary, to build your dream home or rental accommodations in a growing development with great neighbors! Get the insights on what you can do to help sell your property faster. Let our experience team be your guide. List with RE/MAX today!Click here to learn how! Not a Member?Sign up now Forgot Password?